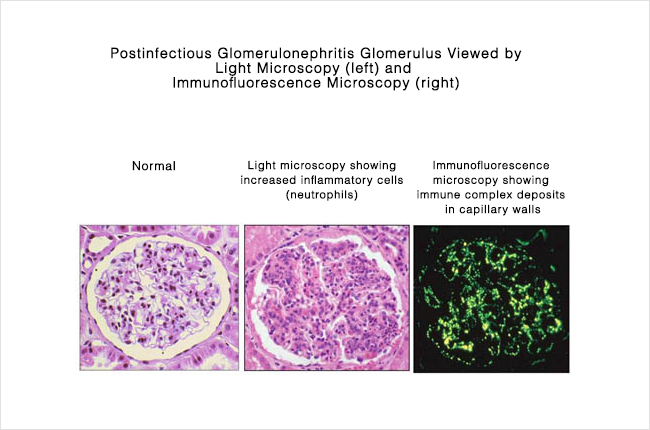 How is Post-Infectious Glomerulonephritis diagnosed? What are the chances that I will get better? The main functions of the kidneys are controlling the balance of fluid in your body, filtering your blood, passing the waste products on to your bladder as urine, and controlling blood pressure. Each of your kidneys contains about one million nephrons. Nephrons are small structures that do the work in your kidneys. Each nephron has a small blood vessel that brings in unfiltered blood, a glomerulus which is a tiny ball-shaped structure composed of blood vessels actively involved in the filtration of the blood to form urine. A tubule carries away filtered waste materials in the urine, and a small blood vessel returns filtered blood to the body. Any disease of the kidney filters must be considered serious because it interferes with the basic functions of the kidneys. The kidney’s job is to filter liquids and get rid of waste products. Post-Infectious GN is a disease that occurs in the kidneys. It is the result of an infection of a completely different area, such as the skin or throat. The infection causes filters in the kidneys to become swollen. This makes the kidneys less able to filter and remove wastes. This disorder may begin to develop one to two weeks after an untreated throat infection, and three to four weeks after an untreated skin infection. This condition can occur at any age. However, it is mostly common in children ages six to ten. This condition is also known to affect twice as many males than females. After a kidney biopsy is done, the tissue is looked at under a microscope. In Post-Infectious GN, the kidney filters appear large, with obvious increases in the number of inflammatory cells. In some cases, it is possible to see well-defined rounded deposits outside of the capillary walls which look like humps. The presence of these humps may be a sign of Post-Infectious GN. 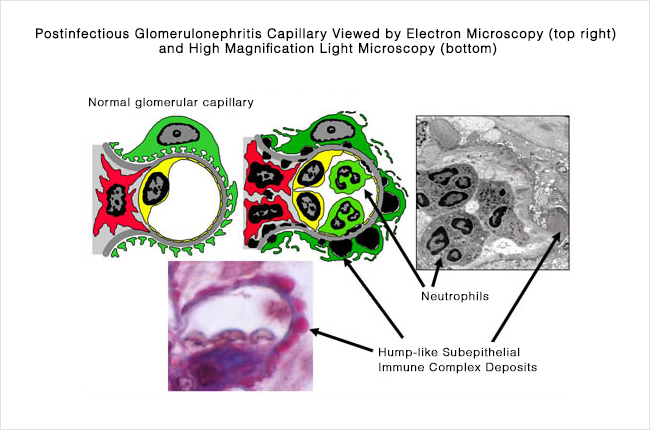 But it can also be seen in other types of glomerulonephritis. Your immune system protects you against diseases by finding and killing bacteria. Bacteria and its toxins, which are called antigens, activate your immune system. Your immune system then builds antibodies which bind to the toxin. This binding activates another part of your immune system which is called the complement system. This system is responsible for destroying these bacteria. In other words, antibodies find the target and complement destroys it. In the case of Post-Infectious GN, these immune complexes (formed from antigen, antibodies, and complement) get trapped in your kidney filters. The filters become inflamed, which leads to ineffective kidney function. Not everybody who has a sore throat or skin infection develops this type of glomerulonephritis. For this reason it is thought that there are some genetic factors that put people at risk for this. The symptoms of this condition are fluid retention with generalized swelling; swelling of the abdomen; swelling of the face or eyes; swelling of the feet, ankles, and arms and legs. Symptoms also include high blood pressure, Coca-Cola colored urine, blood in the urine, decreased amount of urine, joint stiffness and joint pain. Blood testing shows indicators of a specific type of recent infection. There is no specific treatment for Post-Infectious GN. Treatment is focused on relieving symptoms. Antibiotics, such as penicillin, should be used to treat any bacterial infection. Blood pressure medications and diuretic medications may be needed to control swelling and high blood pressure. Dietary salt restriction may be necessary to control swelling and high blood pressure. GN after a Strep infection usually goes away by itself after several weeks to months. In a small number of adults, it may progress to chronic kidney failure.